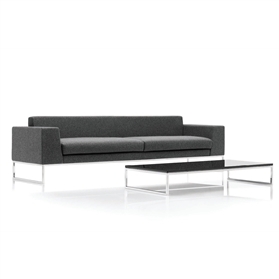 Layla incorporates a hardwood frame and offers maximum corporate appeal through its geometric form that sits comfortably on a refined polished steel base. Layla’s sophisticated style and clean lines make it the ideal solution for reception and lounge areas. Available as a single armchair, 2,3 or 4 seater sofa. Matching coffee table also available. Please contact us for further details. Available as a two seater or three seater (dimensions above).